I Hear Voices! is a unique vocal group from Tucson, Arizona, that was formed in early 2012 by Bobby Kimmel, founder of The Stone Poneys with Linda Ronstadt. Relying on uplifting material and lush vocal harmonies, we mix about half original songs by Bobby Kimmel with songs by other contemporary writers like Ruth Moody of the Wailin’ Jennys and Gillian Welch. Our vocal sound changes with the styles of the songs we sing, from soft jazz to modern bluegrass, with interesting stops in between. Our Newest and Final CD! 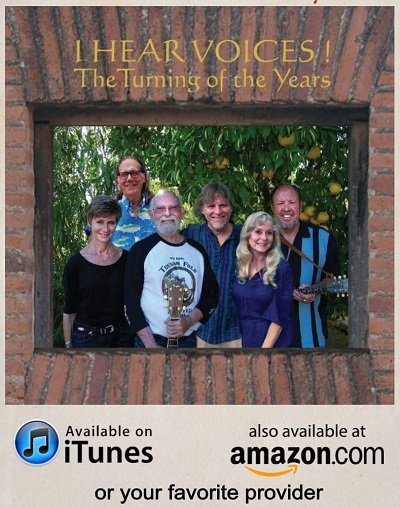 The Turning of the Years is our newest and final CD as I Hear Voices. What a wonerful time we have had for 5 years, producing 4 CDs and travelling as far as McCabe’s in California for gigs. We are so grateful to all of our loyal friends and fans. We will still have our Facebook page and this Website for questions or comments. And most of us are still doing music in one form or another. ©2019 All images, web pages, music, and texts are protected under US and International copyright laws.